Wait what? Since when do “healthy” and “fudge” ever go in the same sentence? Not very often, that’s for sure. This fudge uses good ingredients that are better for you than your regular combination of butter and granulated sugar. The benefits from coconut oil alone, especially raw, speak for itself. Why is it good for you? Well it promotes weight loss (yes, even though it’s fat), it’s good for your immune system and your digestive system, it’s good for your heart, and it tastes delicious. Combine this superfood with cocoa powder and palm sugar (unrefined sugar, so it’s not as bad for you as white granulated sugar), and you get delicious fudge. I first tried making this fudge last year but I couldn’t find the palm sugar. I found some organic palm sugar at the grocery store but it was dry and the granules were really big. I tried to blend it into the mixture but as the fudge was cooling, all the sugar settled at the bottom, which was not as good. I also melted the coconut oil (it’s actually solid at room temperature) before mixing it in like it said in the recipe, but again, I found that all the ingredients would just settle to the bottom while the chocolate coconut oil would solidify on top. Finally, I was at the local asian grocer in Mississauga and I found palm sugar that was a paste! I was so excited! I then decided to just blend everything together as it was: raw, beautiful, and delicious. And boy oh boy, it turned out beautifully! This was the beginning of a wonderful day. But you know what made it better? Soupstock. I went to SoupstockÂ today with a couple friends and I had three bowls of delicious soup! One was pumpkin and butternut squash with goat cheese, another was butternut squash and kale with pumpkin seeds and hemp seeds, and the last was caramel apple horseradish soup. I’d provide pictures but they’re just not the greatest quality, but feel free to check out my twitter to see what they looked like. Unfortunately I forgot to take my camera battery out of the charger today so I had my camera, but not my battery. Sad times. Thus, I can only provide you with pictures from my phone. But yes, the whole purpose behind Soupstock was to stop a mega-quarry from being built on Ontario farmland, which is some of the last pristine and best parts of farmland in Ontario. So why not support this totally worthy cause by coming out to Soupstock and eating food that was grown in that farmland? Anyway, I hope you guys watch that video, and get informed about this project that will affect whether or not we can locally grow our food. Local food > imported. 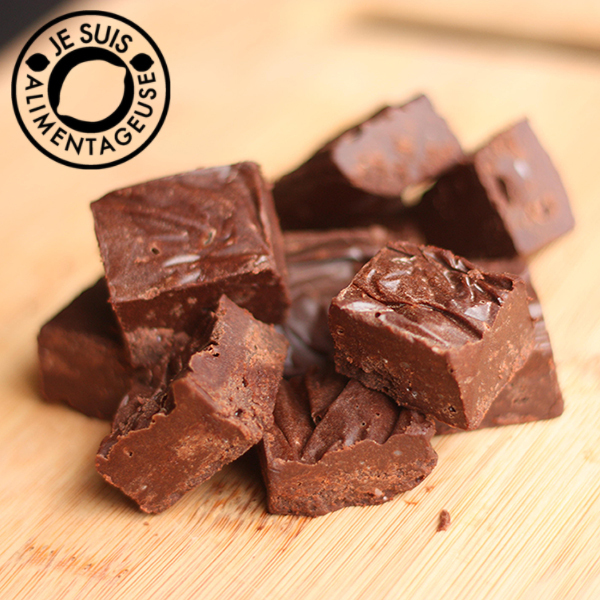 Increase your raw coconut oil intake with this healthier fudge with no refined sugar! Scoop into a loaf pan that is lined with plastic wrap. Use the longer pieces of plastic wrap to flatten the top so you have a flat brick of fudge. Cut into squares, then store in the fridge until you want to eat it. Depending on how hot it is, the coconut oil may melt again if left out of the fridge. This looks really good and interesting recipe. I will have to see if I am able to find the ingredients here. I was just looking at fudge recipes that use coconut oil and then came across this recipe from another blog I follow! I use coconut oil in some no-bake granola bars that I make and it makes the texture so smooth and creamy. I canâ€™t wait to make this fudge with coconut oil! Ooh no-bake granola bars sound great! I just checked out your blog and your recipes look delicious =) You just got yourself another RSS subscriber!